On the subject of Fire Records - well worth checking out Luke Haines (Auteurs) book 'Bad Vibes' for a vivid description of how awful they were as a label. And because it's a damn great read too. hey congrats for the blog! i´d like to ask u a favor. do u know any of these songs? maybe it´s not exactly your style, or doesnt fit in this blog, but maybe you or somebody else know at least one of these songs. i think they are from the 90's and are european. i know one is on tape by the pooh sticks, but which version? they are mainly indie pop punk rock or whatever... and also think some are really good. the sound quality is not good. Re: Angel's comment, the first one I'm 99% sure is the Pooh Sticks, if anyone else happens to know what the others are..? 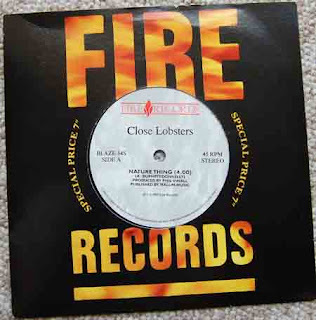 I *loved* the Close Lobsters. Specifically their second album Headache Rhetoric (the CD of which handily contains their almost as good debut Foxheads Stalk This Land). But their absolute best tune was definitely Let's Make Some Plans (which I believe was the tune the Wedding Present covered). They deserve a place in the indie hall of fame just on the basis of that track. *sigh*.